Thinking About Doing Your Own Carpet Demo? In this day and age of trying to save a buck or two on your home remodel you may want to consider doing your own demo. If you’re planning on installing your new flooring project soon, doing your own demo (removal of existing floor covering) may save you a few bucks. Here is how you can Do-It-Yourself. For this project we will assume that we will be installing a new floating wood project. 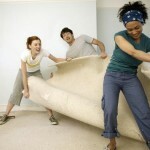 If you have an existing old carpet to tear out here is what you will need. First start in one corner of the room and then pull up the carpet off the tack strip. Once you pulled up the corner, pull along one wall raising the carpet only as high as to release it from the tack strip pins. If the carpet is down so tight that you cannot grip it to pull it up, try cutting a slit down through the top of the carpet in the corner large enough to get your hand underneath then pull it up. Now go around the perimeter of the room pulling it up along the wall from corner to corner. Once the carpet is released from the tack strip it’s time to start cutting the rug. First cut the carpet at any doorway seams to separate one room from another. 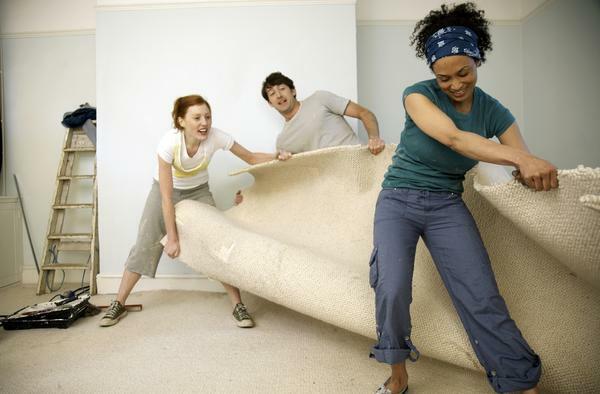 Carpet is very heavy so you will want to cut the carpet in manageable size strips maybe four to six feet wide. Then roll it up in individual pieces light enough to carry without hurting yourself. Once the carpet is gone take your floor scrapper and remove the padding, it may be glued or stapled. Wear your gloves! Staples are sharp and trust me I have the scars to prove it. Once you have released the pad roll it up and dispose of properly. Depending on where you live you may be able to recycle the padding and the carpet both, which will save you dump fees and possible pay for your gas as well. I’ve gotten as much as $40.00 for a whole house worth of old nasty padding. Now it’s time to tackle the wood tack strip around the perimeter of the room. Grab your pry bar and hammer, put on your gloves and safety glasses. Take the curved edge of the pry bar place it on the floor up against the tack strip right next to one of the nails that secures it to the floor. Start at either end of the tack strip, now hit the pry bar down low by the floor with your hammer to dislodge the nail and raise up the tack strip. Once the first nail pops up move to the next nail. Do this around the entire room until all the tack strip is removed. Dispose of carefully as tack strip pins are very sharp and very painful. Double check the perimeter of the room for any tack strip nails that may have been left behind and remove them with your pry bar. If you ever need advice, guidance or have questions you can always get in touch with me under the “Ask Ron” section of our blog HERE. Thinking About Doing Your Own Ceramic Tile Demo?